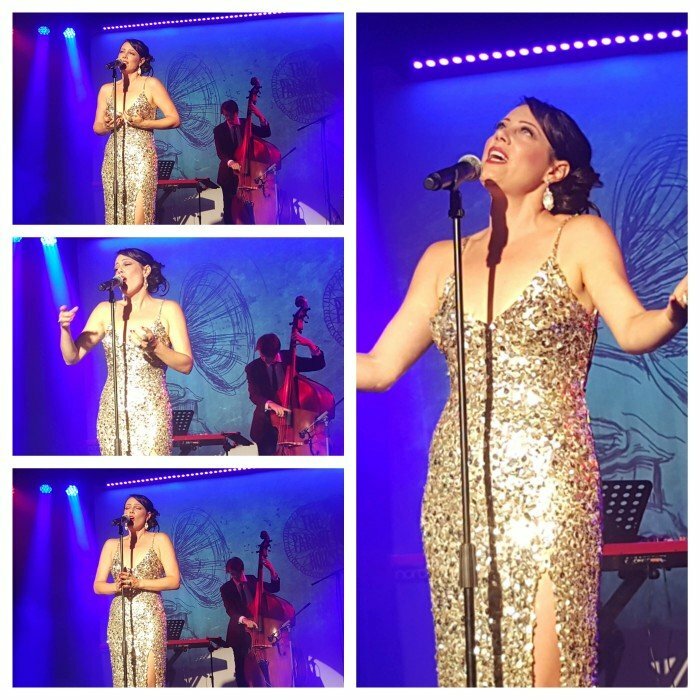 So you’re in Dubai on a stopover! Fantastic! We hope it’s a nice long stopover because there are a lot of fun things to do in Dubai. This desert city is a major connection for many flights, and if you have time for some Dubai sightseeing you’re in for a cultural treat – there are so many places to visit in Dubai from the sublime to the beautiful. Dubai has a tropical desert climate and summers are hot and humid. The best time to visit Dubai is from around November to March with February generally being the wettest month. In reality there are only two seasons in Dubai, hot and hotter. 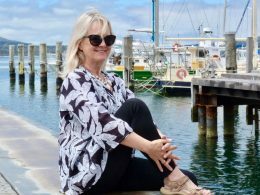 However, during the cooler months you’ll enjoy fabulous beach weather and blue skies. Don’t forget though that this is also peak tourist season. So we’re assuming you have at least 20 hours to find out what to see in Dubai on your stopover. We’re going to show you the best places to visit in Dubai during the daytime, and where to go in Dubai if you’re looking some fun things to do in Dubai at night. 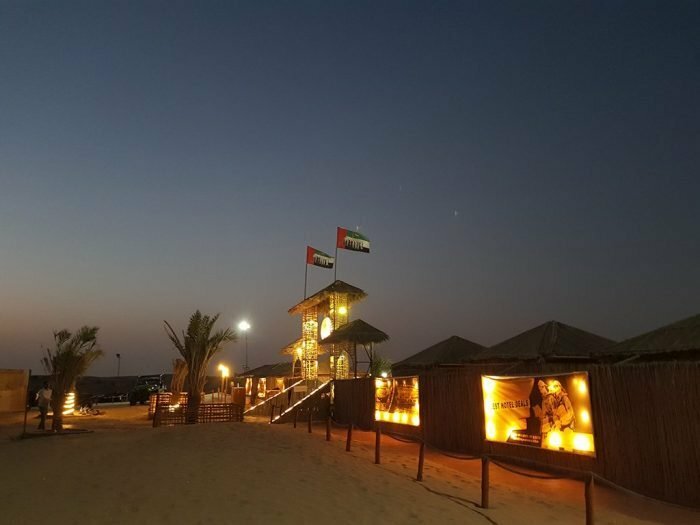 Without further ado here are 10 of the best things to do in Dubai if you only have a short time for some Dubai sightseeing on a quick stopover. Dubai is a very friendly city, especially for kids and older people. 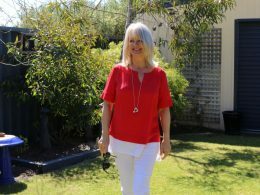 There’s no need to climb stairs or walk anywhere – the transport facilities are excellent, and there’s air conditioning everywhere inside to keep you cool while the sun rages above. 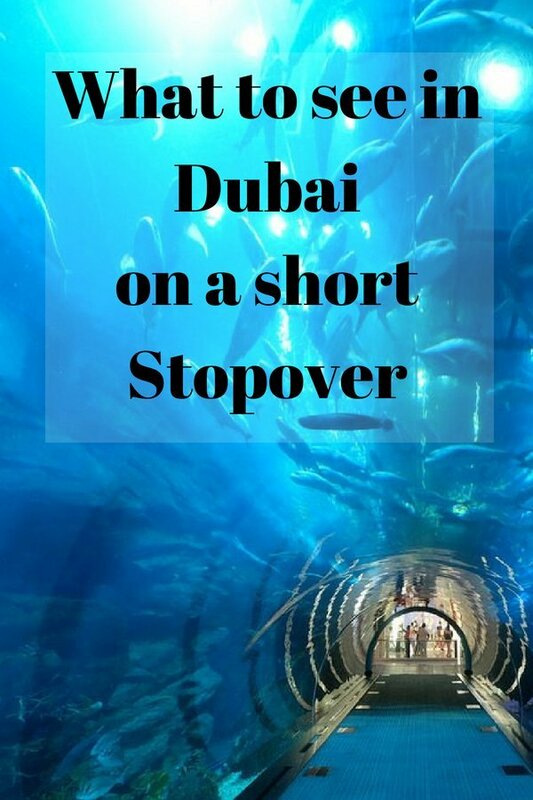 So come with us and explore where to go in Dubai, and 10 fun things to do in Dubai if you only have a short time in this amazing city on a stopover. 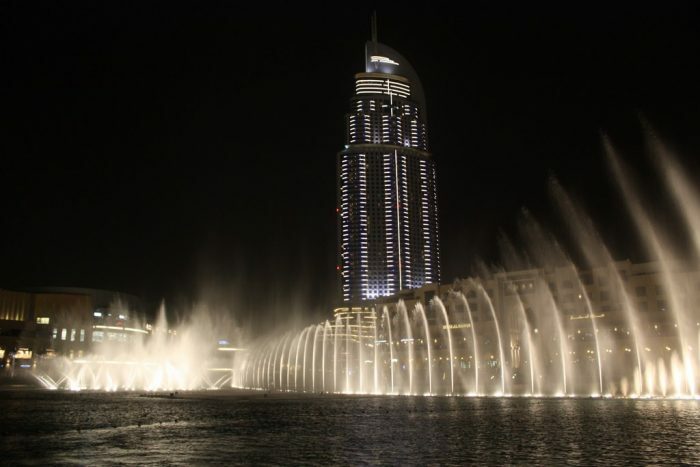 The beautifully-choreographed Dubai Fountain is the largest of its kind in the world. Hundreds of coloured lights are stationed underneath the water jets, colouring the water in multiple hues as it jets upwards to a height of 500 feet. It’s a remarkable sight, especially as it is accompanied by world music and select numbers from Arabian music. The Dubai Fountain is a sight for sore eyes, and will gladden any jet-lagged heart. Now for some retail therapy. Dubai sightseeing is great, but so is the shopping! 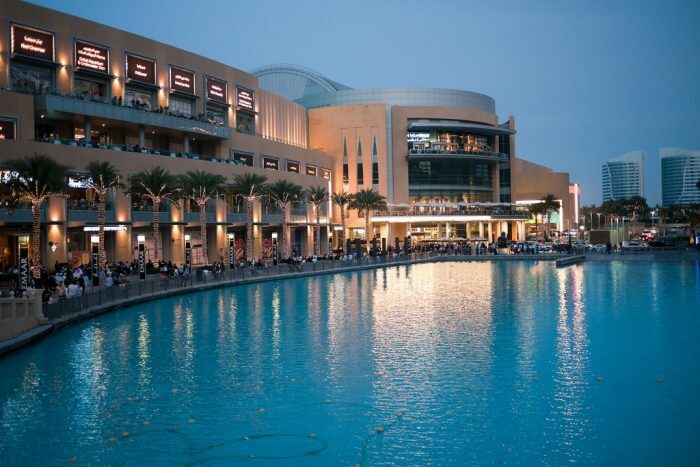 Explore the Dubai Mall’s many outlets – 1200 plus in all. You may not have the time to check them all out, but you can browse through the boutiques, the galleries and the halls to admire the sheer effrontery of the décor. 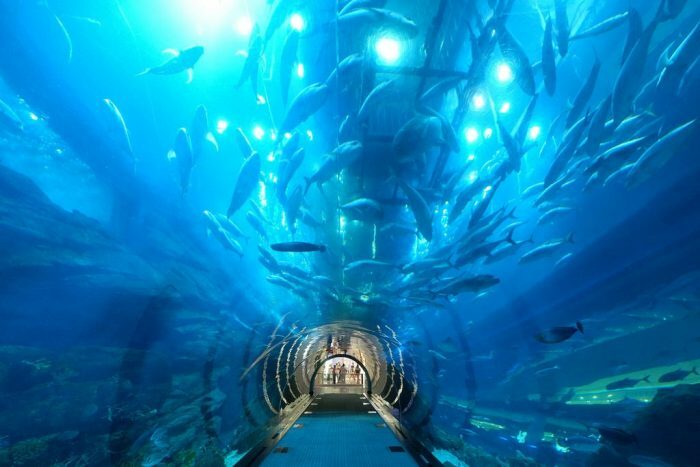 If you’re sightseeing in Dubai with kids, then the Dubai Aquarium is a must-see. A huge expanse of sea water behind the longest acrylic wall. There’s also an acrylic tunnel under which you can walk and get up close and cosy with sharks and manta rays and schools of colourful fish. Bid a sad goodbye to the terrific Burj Khalifa and the Dubai Mall and move on to the nearby Souk Madinat Jumeirah. Dubai sightseeing must include a souk or two. Explore this wonderful old Arabian shopping centre with its rows of handmade lamps, pottery and touristy-type trinkets. It’s a great place to pick up some souvenirs and a box of baklava. 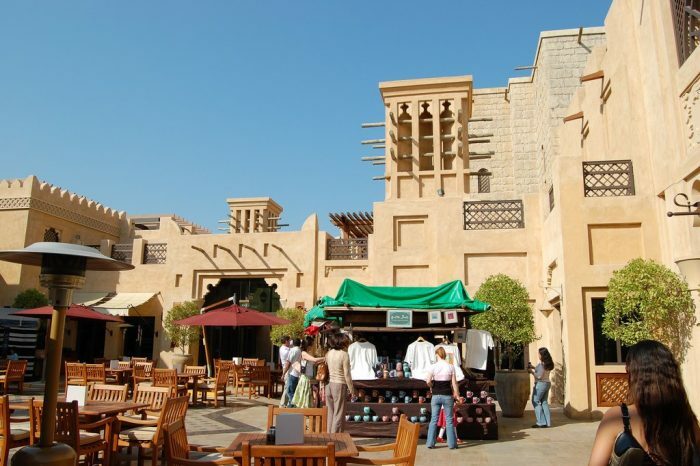 Souk Madinat Jumeirah combines both the modern and traditional Middle Eastern shopping culture. There are stalls and stands selling souvenirs, spices and pashmina shawls, and a range of boutique brands selling luxury fashion and gold. There are 25 restaurants at the Souk Madinat – the perfect place to grab a great bite to eat before you move on! Time to enjoy a fabulous helicopter ride over Dubai. 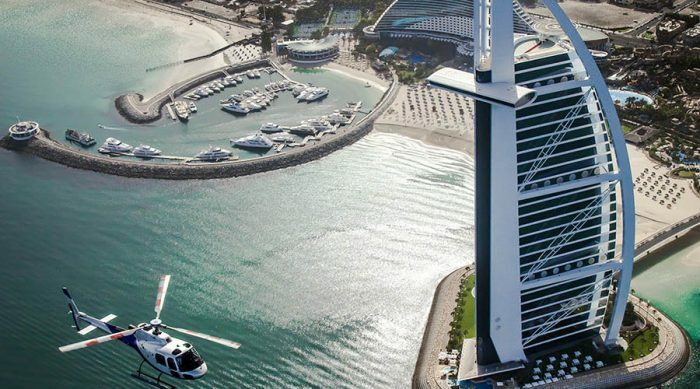 If you’re short on time in Dubai sightseeing, then a helicopter ride from Dubai Marina is the easiest and quickest way to get the perfect aerial view of the city. Feast your eyes on the Burj Khalifa from high above, and the Dubai Frame, the upcoming Dubai Eye construction and various other exclusive landmarks. 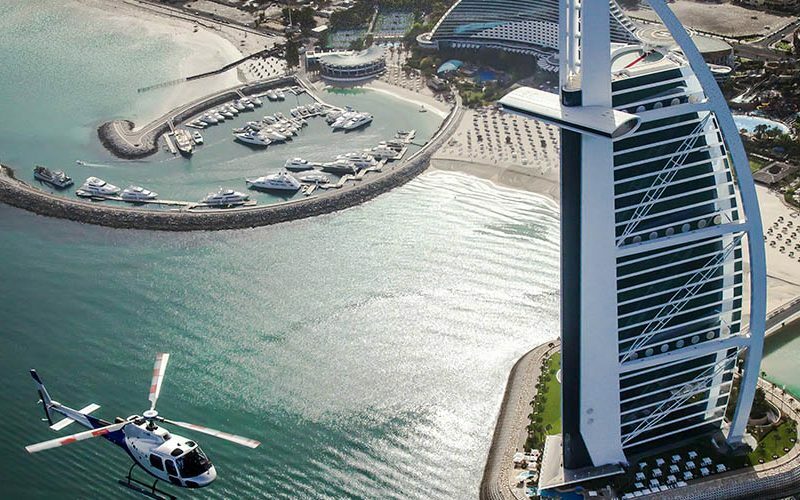 Land on the heliport at the Burj Al Arab, situated on the outer edge of a frond of the pristine Palm Island, that remarkable island made of reclaimed land. Burj Khalifa, the world’s tallest building beckons you. The sun glints off of the steel spirals that climb inexorably toward the clouds. Head straight to this iconic skyscraper after you land or anytime in the middle, it doesn’t take that much a time but is a must visit. Marvel at the amazing building that acts as an anchor for the Dubai Mall and the 24-acre Burj Lake. If you like and the time permits, you can sign up for views from both the observation decks – there’s one on the 125th floor, and one on the 148th . Enjoy the views from the Burj Khalifa observation deck, including a view of the Dubai Fountain show far below. Enjoying the fabulous view from the Burj Khalifa is one of the topmost things to do in Dubai during stopover. Time to enjoy high tea at the SkyView Bar at the sail-shaped Burj Al Arab. This high-end hotel complex includes nine bars and restaurants and is magnificent both inside and out. Reserve your high tea in advance – no one is allowed to wander into the Burj Al Arab without a reservation. 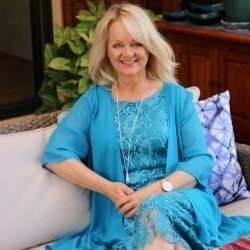 Enjoy your fabulous high tea and explore the hotel as guests. The Burj Al Arab is gloriously golden everywhere, with gold fittings in the bathrooms and suites. It’s a remarkable hotel, of a kind that’s just not to be seen anywhere else in the world. Don’t go back without enjoying a fascinating desert safari. The evening safari begins with a trip to the desert, where you’re encouraged to ride camels to the welcome tent. At the tent, you can put on Arabian costumes if you like, to feel more the part. You can take part in some serious desert sports if you want, like dune bashing, quad biking and sand boarding. If you’re not interested in those, the evening brings on a desert delight that you’ll treasure for ever – an unforgettable sunset. Capture plenty of pictures of the spectacular sunset – it’s a rare opportunity, so take advantage of it. After the sunset come the various entertainments – belly dancing, Tanura dancing and henna tattooing. Just sit back and enjoy yourself as the dancers swirl and twirl around you and the henna artists, while you take sips of fragrant smoke from your shisha pipe. 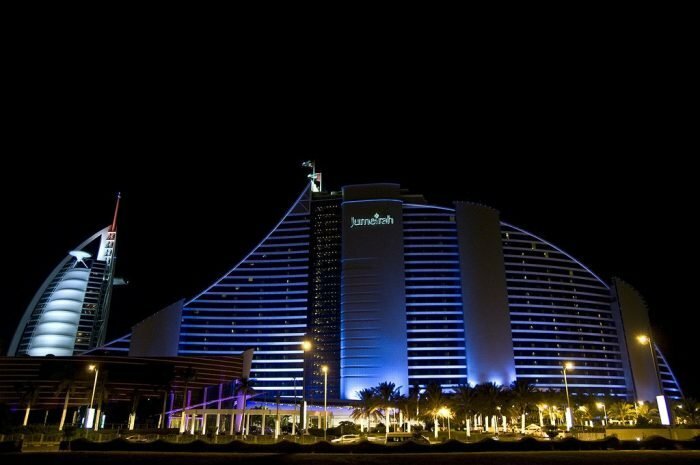 Your evening safari ends with a fabulous dinner of Emirati and Intercontinental cuisine. The night is always young in Dubai. Want to see Dubai ablaze with lights and all the landmarks outlined in multi-coloured LED lights? Dubai is fascinating by day but truly mesmerizing at night. Enjoy a night big bus tour – you can hop off at any stop, check out an attraction on foot, and hop back on to the next bus in line. 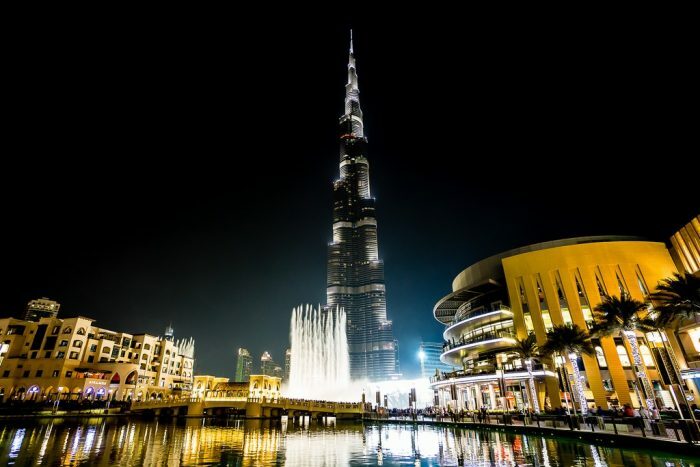 How about signing up for a night walking tour of Dubai, to see all the landmarks that you missed out earlier? Mostly it’s a chance to linger near romantic, brilliantly-lit waterways and canals and enjoy the night air and the colourful lights everywhere. Nighttime in Dubai is mesmerizing, magical, and truly spell-binding. Don’t sleep – there’s so much to enjoy in Dubai at night. You can sleep another day. Now you can enjoy lengthy stopovers in Dubai whenever you fly over the city! Emirates Airlines’ Dubai Connect program offers you a free hotel room for the night and meals if you book flight connections between eight and 24 hours long. 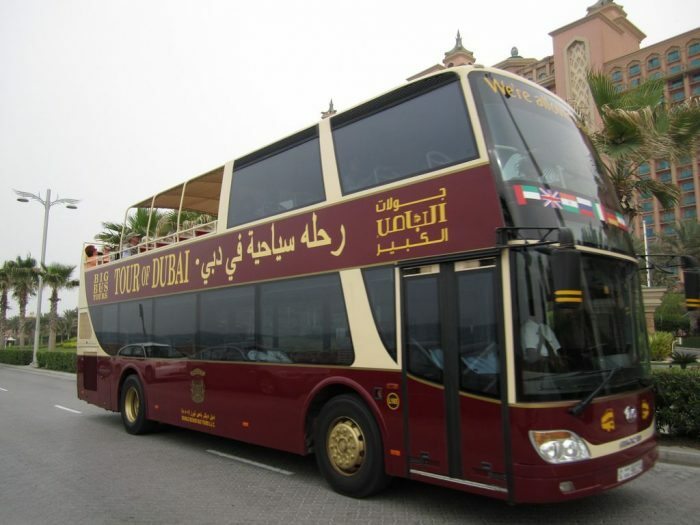 So here’s a way for you to provision an easy and free way to incorporate sightseeing of Dubai into your trip around the world. Enjoy Dubai on your stopovers for as long as 24 hours; the fun doesn’t stop at Dubai so if you want to enjoy the city during the day and night, you can! 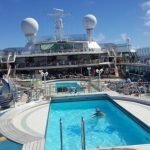 This is a guest post by travel blogger Neha Singh. Dubai has always fascinated me, The burj Khalifa, dubai mall, Aquarium and desert safari, One day I will surely visit Dubai and visit Burj Khalifa, I also write a blog. there are a lot of place you can visit in dubai like Meena Bazzar, Burj al Arab, Dubai fountain and specially dubai Mall. I’ve never stopped over in Dubai but last year we stopped over in Abu Dhabi which looks very similar. I think I would be keen to do a night tour because the heat is so intense during the daytime. We found it incredibly hot trying to sightsee during the day. 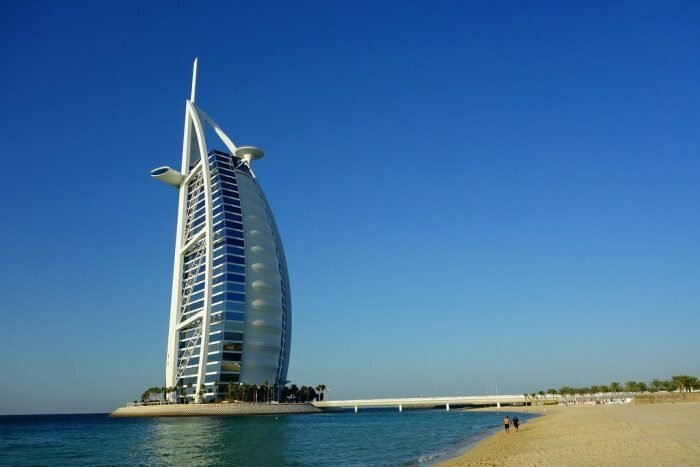 Great inclusions of things to do in Dubai on a short stopover. I will surely incorporate this brief itinerary whenever I am in this pearl city. In fact, it’s been my long-cherished dream to visit Dubai. But luck hasn’t smiled on me yet. Nevertheless, I am still hopeful that one day I will surely place my foot on this wonderful land. Great list! Dubai has long been on my bucket list but I have yet to make it there. I appreciate having a list that will help me prioritize – even if my first visit is just during a flight layover. I’ll pin this for later, and will share on G+ and Twitter too. Thanks again! 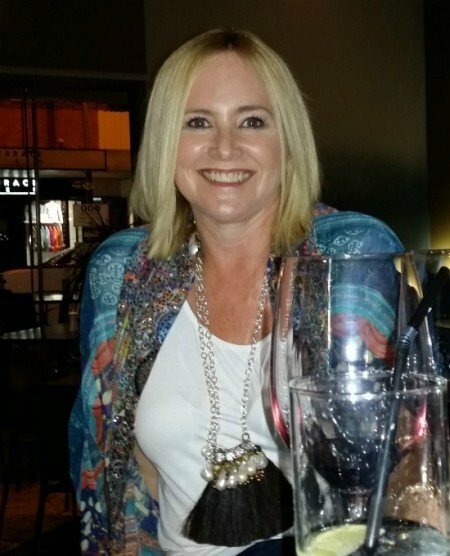 Hi Stacy, I love Dubai – the buzz, the excitement, all the incredible man-made wonders, the souks, and the culture – I hope you get to visit – even a short stopover is good for some Dubai Sightseeing.